Enjoying Paranormal, Urban Fantasy & All Things Romance. Our primary focus is on Paranormal Romance and Urban Fantasy; however, we cover a range of genres including: Historical Romance, LGBTQ, Science Fiction, Steampunk, and more! Plus, author interviews, giveaways, and contests. 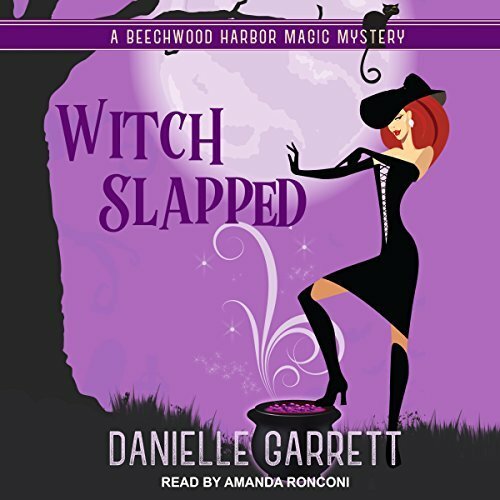 Ghosts Gone Wild is the second story in the Beechwood Harbor Ghost Mysteries, and I enjoyed it quite a bit. After meeting Scarlet the “ghost whisper” and learning of her talents in the first book (and prequel short stories), I felt the author did a great job ramping up Scarlet’s personality and abilities. With so many ghost around and an abundant supply of potential murder victims (in the volume of tourists that visit the small town), the author could have coasted on a set formula for her books. However, Ms. Garrett doesn’t let Scarlet rest easy. First, let me talk about Scarlet… She’s been able to see and communicate with ghosts since she was a child. While we get glimpses of what knowledge she’s gathered over the years, in Ghosts Gone Wild, Scarlet must really stretch her understanding of the dead, giving her the opportunity to grow both in ability and in knowledge. And the more one knows, the more one realizes they DON’T know, so the door has opened for Scarlet, and I look forward to seeing where she goes with her gifts. I also appreciate that the “formula” for ghosts and mysteries is different in book two. While Scarlet once again must deal with a departed soul who has an axe to grind (unfinished business), she also has to deal with an active murder investigation AND the disappearance of her local ghostly friends. The story is complex and interesting, and more than just a simple cozy mystery. Finally, I adore that Scarlet has a serious love interest in security expert Lucas. While there was a spark of romance in the first book, things get more serious in Ghosts Gone Wild when Lucas returns on his mid-season break to spend several weeks with Scarlet. I adore watching Scarlet get both excited and panic when dealing with her growing feelings. The author does a great job giving listeners a romance without overshadowing the main story. Narration: I’ve been listening to Amanda Ronconi read the original series and now this spin-off for over a half dozen books, and she has consistently done a wonderful job. The Beechwood Harbor Ghost Mysteries is voiced from the first person POV of Scarlet. Ms. Ronconi captures Scarlet’s kindness, generosity, and determination. But also convincingly voices her frustration when called for. Additionally, Ms. Ronconi gives each of the three primary ghost regulars distinct and appropriate voices. Finally, her male voices are generally deeper and fitting. Overall, I really enjoyed Ghosts Gone Wild – the whole story felt tighter, more engaging, more complex than the first book, The Ghost Hunter Next Door. The narration really blossomed as well – with most of the characters being ghosts, Ms. Ronconi has put a lot of “life” and variety into their overall sound. Missing ghosts, a posthumously alimony-hungry divorcee, and a raging bridezilla. Yup, my bingo card is officially full. Can I get a prize and go home now? Scarlet has been able to see and communicate with ghosts since her 8th birthday when her deceased cat, Flapjack, made his first appearance. Now she and her constant companions talking cat, Flapjack, and British gent, Hayward, reside in Beechwood Harbor, a community filled with supernaturals. Ghosts are drawn to Scarlet, and she finds a way to help them cope and deal with death and those still living. However, things change when a violent ghost named Rosie demands Scarlet stop a reality TV crew from renovating the Lilac House. Rosie has abilities beyond any Scarlet has seen, and Rosie intends to use them to hurt the humans invading “her” home. The Ghost Hunter Next Door is the first cozy in the Beechwood Harbor Ghost Mysteries, a spin-off of the Beechwood Harbor Magic Mysteries. Although the series share the same setting and few crossover characters, this book is completely independent of the original series and one does not need to read it first. Being the first book in the series, time is spent acquainting listeners with the setting and primary characters. I enjoyed seeing Beechwood Harbor from the eyes of Scarlet, who is a pretty solitary soul. Many of the characters are, in fact, ghosts, including Gwen from the original series. Additionally, we meet Lucas, the hunky head of the show’s security. For some reason, Scarlet feels a bond with Lucas, allowing her to share her secrets with him. And for once in her life, someone believes her and believes in her. I like that Scarlet has a confidant to help her solve the mystery, but more importantly, give her a much-needed close friend (and love interest). In the beginning, there was a slight suggestion of a potential love triangle with a local police officer, but it wasn’t pursued at any length in this book, thankfully. The mystery of who Rosie is and why she is such an angry ghost morphs into a pretty good murder mystery. I had fun trying to figure it all out as Scarlet and Lucas dig into the past. I really enjoyed the conclusion, especially how Scarlet gives Rosie the gift of peace. I’ve been listening to Amanda Ronconi read the original series for a half dozen books now, and she has consistently done a wonderful job. This time around, the book is voiced from the first person POV of Scarlet, who has a different personality than Holly (original series heroine). Ms. Ronconi changes a little here and there to convincingly portray a new main character. Additionally, the three primary ghost regulars have distinct voices. While there is little difference between the each of the male characters’ voices, the tone is deeper and fitting. In the end, The Ghost Hunter Next Door is a solid kickoff for this new series. The story is both interesting and sweet. I like that Scarlet has someone she trusts and can confide in, and I love the blossoming romance between her and Lucas. With Fried Chicken & Fangs opening just a couple months after the conclusion of the first book, we discover the town of Honeysuckle Hollow, along with main character Charli, embracing some changes brought up in the first title. The town added a non-witch council seat to its governing body, and the election is in full swing. Additionally, Charli is more open about her tracking talent, openly using it to help the town’s denizens. Yet when valuable personal items go missing, suddenly Charli struggles with her abilities. When one of the beloved townsfolk is found dead, and crimes start implicating the various candidates, Charli decides it is time to get involved. While it is pretty clear from the beginning who is behind the problems in Honeysuckle, the entire investigation is entertaining to follow. I enjoyed listening to Charli as she pulls out clues and pieces them together. However, it is a bit odd that other than Charli, the only other competent investigator appears to be Warden Mason. Luckily the pair works well together, and I like them together, despite my reservations over a potential love triangle brewing. Outside of the murder mystery, Charli’s personal life and ties to shifter Dash, are expanded upon in Fried Chicken & Fangs. Apparently, there was some sort of mishap with a cupid’s arrow or love potion gone wrong that takes place between the first and second books, but the reader isn’t privy to the details. I felt like I missed reading a novella or something. While it added a bit of confusion for me, I was able to glean that both Mason and Dash made it known to Charli they are interested in her. This plays out with Dash being an aggressor of sorts (the book is very “G” when it comes to romance), and Mason embarrassed and distant. I’m glad the author gives us (and Charli) more of Dash and his past, but just when he grows a little closer, his past pulls him away. I like Dash and Charli together, they seem to fit, and I hope the author continues down this path. Ms. Parker provides a wonderful southern drawl to Charli, bringing her wit and charm to life. Her easy-going narration sets the tempo and mood, keeping the cozy mystery light and entertaining. Additionally, she creates a number of unique voices for each of the paranormal creatures, from squeaky fairies to snooty vampires. While some of the characters sound a bit odd, it suits their nature and helps develop the setting and scene. In the end, I enjoyed my return trip to Honeysuckle Hollow. Fried Chicken & Fangs is a stronger story than its predecessor, and I look forward to listening to the third book soon! An upcoming election and some new visitors to Honeysuckle shake up the magical small Southern town. When a beloved family member of one of the candidates disappears, it’s up to Charli Goodwin and her special talents to get on the case. What starts as a simple search uncovers a darker layer of manipulation and sabotage. Will she be able to figure out who is pulling the strings before the foundations of the town are destroyed? Picking up with the residents of Honeysuckle Hollow about two months after the conclusion of the previous book, Sweet Tea & Spells opens with Clementine’s bridal shower. Although protagonist Charli doesn’t see eye-to-eye with Clementine’s mother, Aunt Nora, and Clementine is marrying Charli’s ex, Tucker, Charli feels she should make an attempt to connect with her only family. Unfortunately, things go wrong with cake and Aunt Nora blames Charli. This is where we first meet bad guy Duke, a man who keeps secrets on all the powerful people in the wizarding world. So, when Duke turns up dead, there is no shortage of suspects, nor is there a shortage of reasons why he was killed. The murder mystery aspect of Sweet Tea & Spells was very interesting. The storyline was the most complex to date in this paranormal cozy mystery series. With each suspect, there was a different motive for hating the dead man. He held secrets on many powerful people, as well as having a siren slave who was required to do his dirty work. It took a while for the pieces to fall into place, and I pretty much guessed what had happened, but I liked how this storyline moved and flowed through the book. My only issue was once the criminal was “unmasked,” his demeanor changed one-eighty from belligerent to cooperative. It felt sudden and out of character. While the murder storyline was fairly involved, the entire book was filled with a number of side stories, some pertaining to the mystery, and others not at all. After a while, I felt that there were too many extraneous side stories, making it overwhelming and difficult to follow everything that was happening. Another issue I had with the book was the portrayal of the sheriff and the “local police” as completely inept without Mason in town. I want to know when in the past year or so we’ve been visiting Honeysuckle, did Mason become the only detective that knows basic police procedures. The ordeal is used as a plot device to get Charli involved in the case, even after Mason returns. It was weak and disappointing. I was also frustrated with the developing romantic storyline for this series. In the previous book, Charli grew close to Dash, and I felt like she’d made her choice. But the author kept him out of Sweet Tea & Spells completely, and in steps Mason. And Mason is a “new man,” having returned from a dangerous mission “up north.” He’s rough around the edges, but open and honest with Charli about his past – something Dash refused do previously. Overall, the romantic storyline was subpar, and I felt it brought down the quality of the tale. Having listened to two previous books in this series, I have come to associate Ms. Parker’s voice with heroine Charli. Her easy-going southern drawl brings Charli, and all of her idiosyncrasies, to life. Additionally, she is able to add just enough emotion into Charli to help identify when she’s frustrated, joyful, sad, etc. Ms. Parker’s narrative style sets the tempo and mood, keeping the cozy mystery light and entertaining. Additionally, she successfully creates a number of unique voices for each of the supporting paranormal creatures. In the end, I enjoyed listening to Sweet Tea & Spells, despite the few issues I had with the storylines. I definitely want to know what is in store for Charli down the road, I just hope that the romantic storyline is downplayed a bit more, while keeping up the calibre of the mysteries. A prank war has erupted in Honeysuckle, and spells are flying everywhere. All’s fair in spells and sport, but when one goes terribly wrong and someone ends up dead, it’s up to Charli Goodwin to figure out who’s to blame. At the same time, she’s also on a mission to learn more about her past and do her best to harness her growing magical powers. Will she be able to pull herself together in time to stop things before more lives are at stake in the magical small Southern town? Moonshine and Magic, the first title of a quaint, paranormal cozy mystery series, centers on the return of Charli Goodwin to her hometown of Honeysuckle Hollow, a place where non-humans can live together peacefully. Charli is a witch with an rare talent for finding misplaced items and people. She abruptly left Honeysuckle Hollow, and her finance, roughly a year ago, and her return goes a bit south when first her ex-finance proposes to her bratty cousin in front of the entire town, followed by Charli’s discovery that her favorite uncle is dead. Moonshine and Magic was a rough start for me. First I was confused as to how long Charli was gone from her hometown. At times it was “forever ago,” but then “not that long ago.” Additionally, Charli came off selfish, not telling her loved ones that she was leaving or where she went. Additionally, I had issues with her older brother, who in his effort to “protect” Charli, was pushy, vague, and unable to stand up to the “paranormal police” when Detective Mason went after her for her involvement in her uncle’s death. The mystery was slow starting and I found myself annoyed with the characters. However, after taking a short break, I jumped back into the audiobook and found it more appealing. Once things settled in and other characters introduced, the mystery of who killed Uncle Tipper picked up speed. Charli is in the middle of it all, and has a few stumbles before capturing the culprit. And although several characters are somewhat stereotypical (bitchy aunt and stuck up cousin, alpha males, potential love triangle, etc. ), I grew to like them and enjoyed the story. My biggest issue with Charli is that she got precariously close to “too stupid to live” territory when her stubborn behaviors nearly killed her three separate times. The narration by Johanna Parker took me a bit to get used to, but only because I have been listening to her read the SPI series by Lisa Shearin, one of which I completed just before starting Moonshine and Magic. This caused some mental confusion for a good quarter or more of the book, thinking I was listening to Mak (SPI) instead of Charli. However, once I finally got into the story and warmed up to the characters, I found Ms. Parker’s performance enjoyable and well-suited for the story and setting. She conveys a charming southern attitude, which fits the small town of Honeysuckle Hollow. She is able to put a bit of desperation into Charli when needed, but generally keeps her voice calm and steady. The supporting characters each have their own unique voice, some of which are a bit odd, but once again, fitting to the unconventional cast of paranormal characters that inhabit the story. Overall, I enjoyed Moonshine and Magic, even with the rough start and my few misgivings. The author set the stage for conflict and intrigue for any upcoming tales, and after warming up to Charli, I look forward to uncovering more mysteries with her. Charli Goodwin doesn’t expect her homecoming to go without a hitch–after all, she skipped town, leaving her fiancé and family without a clue as to where she was going or why. Now that she’s ready to return home, she plans to lay low and sip some of her Nana’s sweet tea while the town gossips come out to play. Unfortunately, on her first night back, Charli discovers the body of her crazy great-uncle, and suddenly finds herself at the center of a mystery that threatens the very foundations of Honeysuckle Hollow and the safety of every paranormal citizen in it–starting with Charli herself. With the clock ticking, will Charli’s special magical talents be enough to save not only the town but also her own life? 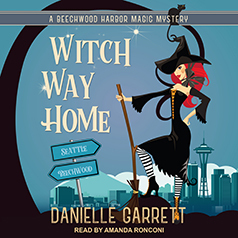 Witch Way Home opens shortly after the mysterious conclusion of the previous book, with our heroine, Holly the witch, reacquainting herself with the Seattle Haven after being banished for the past year. She’s preparing for her hearing with the Haven Council, hoping to gain permission to get her Master Potions license and reopen her store. Unfortunately, things don’t go well for her at the hearing, and it gets even worse when her SPA case worker, Harvey, suddenly leaves the hearing and goes missing. Once again, Holly ends up in the middle of a murder mystery and this time, he own future is at risk. Witch Way Home was an absolute delight, and it addressed pretty much everything I felt was missing from (wrong with) the previous book, Witch Slapped. I loved the focus on Holly: both her quest for her Potion license and how the events surrounding the trial and murder mystery impact her life. Gone were most of the side stories and confusion surrounding Holly when she is around Nick. Don’t get me wrong, Holly is still questioning what she’ll do with her life, but it wasn’t couched in any sort of romance/man-related setting. It’s all her and what she’s going to do – what will make her happy. Once again, Holly and gang are brought to life through the performance of Amanda Ronconi. I adore her work and commend her interpretation of Holly. Ms. Ronconi convincingly portrays Holly’s thoughts, concerns, and expressions. She helps solidify Holly as a favorite character of mine. Her female voices are each a bit different and well-suited. However, her male voices tend to be a bit problematic for me, as many sound alike making it difficult to discern who is speaking from time to time. In the end, I really enjoyed Witch Way Home. There was resolution of some of the earlier plotlines like Holly’s SPA battles, her potion making, Nick knowing about the world of supernaturals. I also liked that this book’s mystery was more personal for Holly and that she relied on the help of Adam and friends, rather than being secretive. After the revelation in the previous Ishmael Jones novel, we were surprised by Into the Thinnest of Air. We weren’t expecting an intermission. 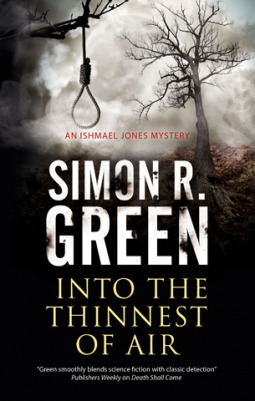 Simon Green’s witty mystery/suspense series with a science-fiction twist has fascinated us for four novels. Ishmael and Penny brave the strange and horrific, sleuthing out the culprit(s) while maintaining witty banter. After the hint given in the previous book we had hoped to learn more about Ishmael’s mysterious past or see if Ishmael decides to dig into it. What we didn’t expect is for Penny to surprise him with a holiday weekend. Into the Thinnest of Air felt like a break in the overarching plot of Ishmael’s past. Penny and Ishmael go into the country for a fun weekend, visiting a group of Penny’s father’s old friends. However, nothing for them is ever as it seems and people begin to disappear after dinner. With no bodies to examine and nothing in the way of clues left, Penny and Ishmael are lost as they try to figure out what is going on. The majority of the novel is mostly the remaining members of the group arguing about if the disappearances are the work of the supernatural or a more mundane monster. This group of friends is made up of a handful of once young-dreamers now resigned middle-aged adults chained to the fate that a bad decision left them. The revelation of the mystery is as fascinating as it is chilling heinous, but it felt as if Penny and Ishmael spent most of the novel either chatting, arguing, or running around in circles. As a standalone mystery, it is interesting but as the next novel in this series, we were a bit let down. Although this is our least favorite story in this series, we still really like this series and are eager to see what happens in the next installment. The mystery/drama may have been a little lackluster, but the humor and wit was still strong. Hopefully it will be less a battle of words and suspicions and more battling of the evil forces in the world in the upcoming story. Our fingers are crossed that more of Ishmael’s background will come into play in the next Ishmael Jones novel. Is the inn really subject to an ancient curse? Skeptical of ghost stories, Ishmael believes the key to the mystery lies in the present rather than the past. But with no bodies, no evidence and no clues to go on, how can he prove it?